We are a pontifical congregation founded in Nigeria in 1937 by Archbishop Charles Heerey, As a missionary congregation, we are in Africa, Europe, USA, the Carribean and Ireland. We work as doctors, nurses, teachers and also do social and pastoral work in the spirit of humility and charisma of compassion. We also have associates of the IHM comprising of Diocesan priests, lay men and women with whom we share our spirit and charisma. As Parish Sisters we pray for the parish and others, work as sacristans and also visit the elderly in nursing homes, the housebound and hospitals administering Holy Communion. The Sisters also visit the Manor Hospital. On July 15th 2017 the Parish Sisters celebrated the 20th and 80th Anniversary of their foundation in England, in our Parish of Bloxwich, and Nigeria respectively. Also it was the 50th anniversary of the death of their founder Archbishop Heerey. His Grace, Archbishop Bernard Longley of Birmingham came and celebrated Mass at Saint Peter's. All the IHM Sisters from the UK came along with priests and parishioners. Archbishop Heerey was born in Oldcastle, Meeth, Ireland, in 1890 and became a Holy Ghost Father in 1909. Father Heerey moved to Nigeria and formed the first seminary in Nigeria for indigenous priests. He later was appointed Arhbishop of Onitsha. He died in 1967. During his time in Nigeria he founded the Sisters of the Immaculate Heart of Mary, Mother of Christ in 1937 when he was Vicar Apostolate. 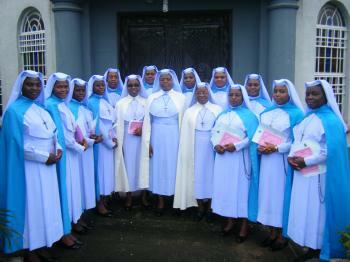 He was insipred on a piulgrimage to Lourdes to found a cngregation of indigenous Nigeria women who could help the plight of the less fortunate in their own country. The congregation started slowly but has spread to over 12 contries around the worls including England. The foundation in England occurred in this parish in 1997 when Father Father Stock, now Bishop of Leeds, invited our Parish Sisters here.